A grant of £2,500 was awarded to the Whitworth Art Gallery, for the acquisition of the above work. It was created by the Manchester-based artist, Barry Finan, and is a vibrantly coloured banner-like work in which paint pens, known as Posca pens, and blank ink, were used on unstretched canvas; it measures 183 x 131 cm. Finan’s art defies categorisation. His wall-based work straddles writing, painting, banner-making and performance. The text in this piece is one of several scripts intended for television that Finan has produced – it draws attention to things that he has seen on his journeys – ‘traffic lighters’ and ‘street lampers’, and also items that he likes to collect – ‘dinky toy roaders’ and ‘sweeters’. The work is activated by anyone who reads the words aloud. Finan produces all of his work in the Venture Arts workshop, an art studio in Hulme, Manchester. The above work was produced as part of a collaborative project, for which the Whitworth was a partner along with BALTIC and Castlefield Art Gallery – OutsiderXchanges. It was instigated and managed by Venture Arts, a charity which organises art programmes for learning disabled artists, focusing on nurturing talent and overall wellbeing through the arts, in the belief that they can play a significant role in transforming lives and reducing isolation and marginalisation. The project involved 12 artists – six learning disabled and 6 who are not – sharing a studio and collaborating as equals to produce experimental new art work. Finan’s work will be placed in the Whitworth main fine art collection, and not in the Musgrave Kinley Outsider Art Collection (MKOAC), housed at the Whitworth, in line with the ongoing integration of all the artwork in the MKOAC into the Gallery’s main collection. This signifies an important shift from conceiving Outsider Art as a separate category of art (into which artists are co-opted, largely on the advice of experts) – to a desire to expand the Whitworth collection in ways that reflect the full diversity of art created by a broad cross-section of society. The acquisition of Finan’s work fits in well with the stipulation of the Nerys Johnson Contemporary Art Fund as regards supporting art which is “distinctive in its imaginative use of colour”. It is also a fitting acquisition given that Nerys was an advocate for greater inclusivity in public museums and a proponent of ‘art for the people.’ The Finan work will enable the Whitworth to involve visitors by asking important questions such as – whose creativity is valued in our galleries and museums, whose creativity isn’t, and why. 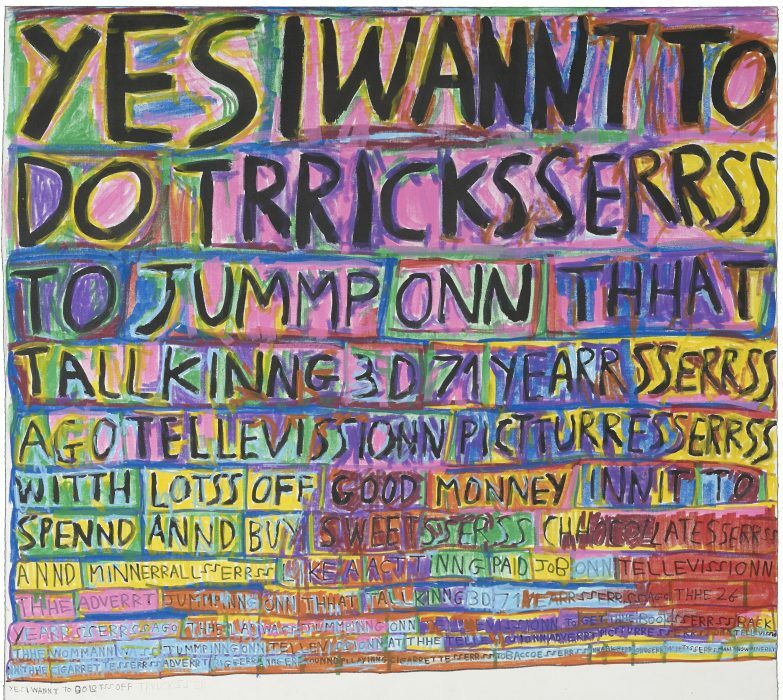 ‘YES I WANNT TO DO TRRICKSSERRSS’ had been shown at venues that include BALTIC Centre for Contemporary Art, Manchester Contemporary Art Fair and The Lowry, and its acquisition continues the Whitworth’s commitment to collect the work of historically marginalised artists.